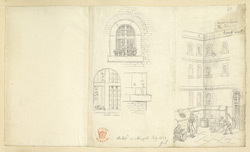 These drawings depict details of Newgate Prison in London. The prison at Newgate was constructed in 1188 on the orders of King Henry I. Its inmates, known as "debtors" and "felons", resided in various sections of the building. The "Common area" held poor prisoners and the "State area" held those that could pay for more comfortable accommodation. Women and children occupied a separate section away from the men. Newgate became a place of execution in 1783, when the gallows at Tyburn were moved to the site. The prison had a poor record regarding security. Jack Sheppard, one of London's most famous 18th century criminals, escaped from the premises three times before he was hung in 1824. Newgate featured in a number of Victorian novels, such as "Great Expectations" and "Oliver Twist" by Charles Dickens. The prison was eventually demolished in 1902, making way for the Old Bailey Courtrooms.